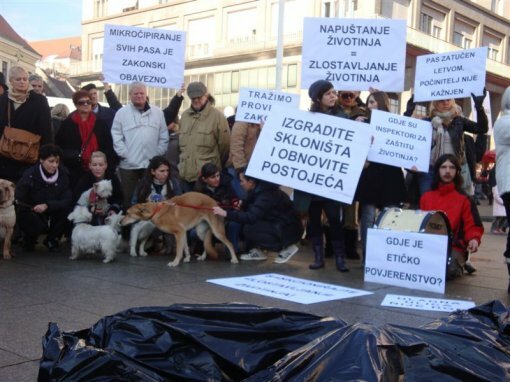 Even though more than four years have passed from the implementation of Animal Protection Act and two years since the final deadline before the regulations were supposed to be enforced, more than a hundred Croatian cities and towns are still breaking the law. 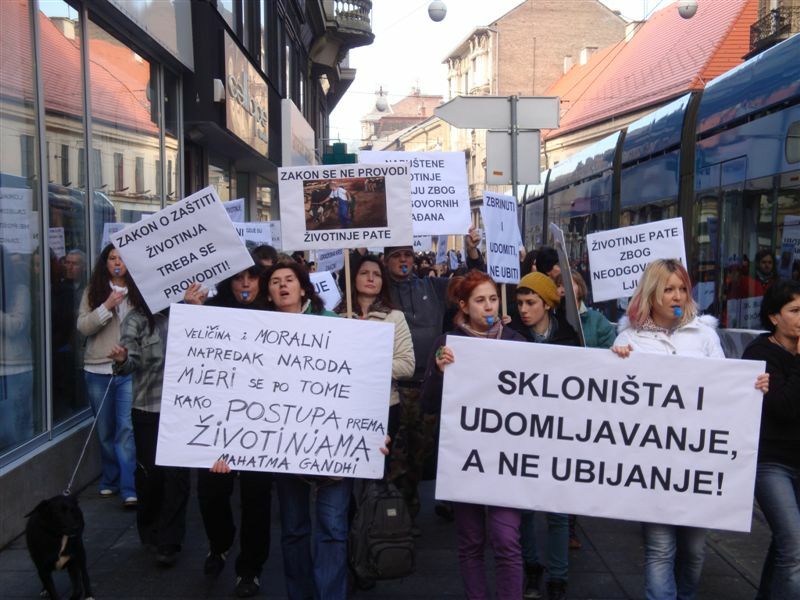 Animal Protection Act is simply not being observed – apart from the currently positive example of Zagreb, local communities have neither built the required shelters for abandoned animals nor organized info-centers or programs for neutering/spaying animals and educating people. Besides, most of the 14 registered shelters are former veterinary hygienic services, the so-called "dog pounds," or veterinary stations that do not fulfil the conditions required by the Animal Protection Act and other legal regulations. They often function under suspicious circumstances and do not have any archival documentation – briefly, their work completely lacks transparency. It may be suspected, and the suspicion often proves justified, that they kill the dogs soon after catching them, without even advertising their adoption or allowing the representatives of animal protection associations to gain an insight into the number of found and adopted dogs or the veterinary care they have been offered. Abandoning a companion animal should be fined with up to 15,000 kuna, but the actual sanctioning takes place only rarely, in sporadic cases. More often it is left to the care of individuals to organize the adoption of an animal, or to associations that are actually not in charge of such activities, yet do it for humane reasons. Abandoned animals are a problem of the entire community. It is actually the public institutions on the level of the state and local administrations that have the duty of accommodating abandoned animals and organizing their adoption, and they are supposed to solve the problem in such a way that no animal gets hurt. It is not the animals' fault that they have been abandoned, and yet they must suffer because or irresponsible humans. Abandoned animals face many dangers: they die in the streets of hunger and thirst, of excessive heat or freezing to death in low temperatures. They get run over by cars or suffer abuse by violent individuals or hunters. Apart from the fact that the local communities do not observe the Animal Protection Act, there is a lack of other regulations and acts, even though the deadline for their implementation has passed long ago. There are no specialized inspectors for animal protection and reports to veterinary inspections largely remain unanswered and unheeded, which discourages people and makes them doubt the efficiency of the legal system. 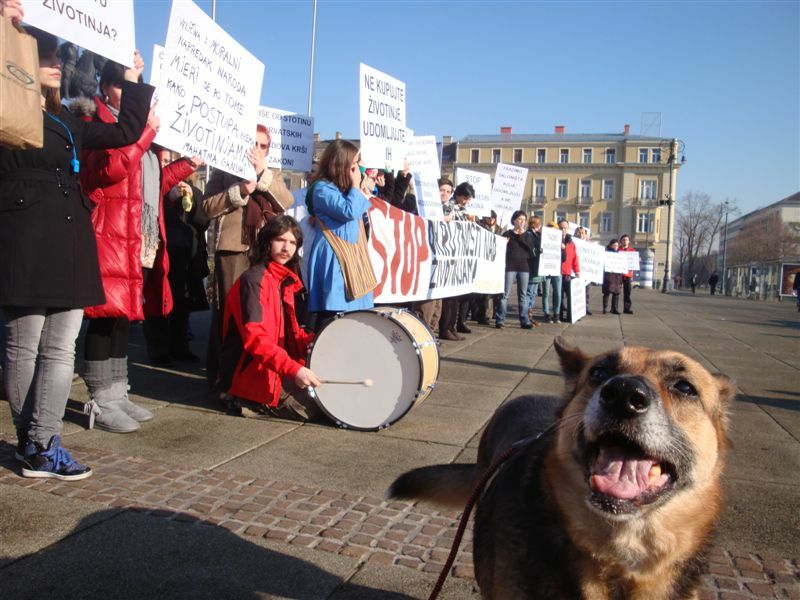 Moreover, after four years the Commission for Animal Protection has still not been established, although it was supposed to supervise the progress of scientific and professional research in the field of animal protection, as well as initiate the enactment or amendment of the relevant existing laws. 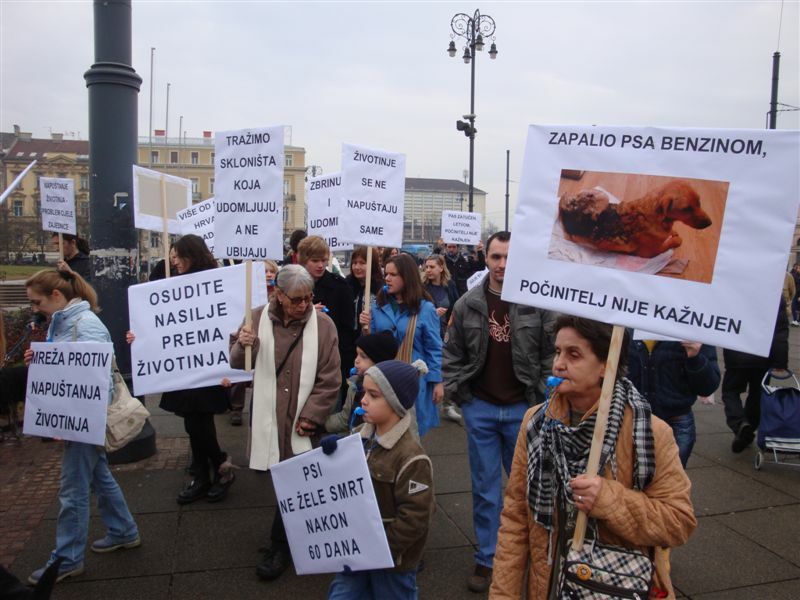 Another organization that has not even begun its activity is the Ethical Commission, which was supposed to give opinions and suggest the criteria in procedures regarding the permission to use animals in experimentation, which is why unnecessary and painful experiments are still done in Croatia without the control of the Commission, although it is prescribed by the law. 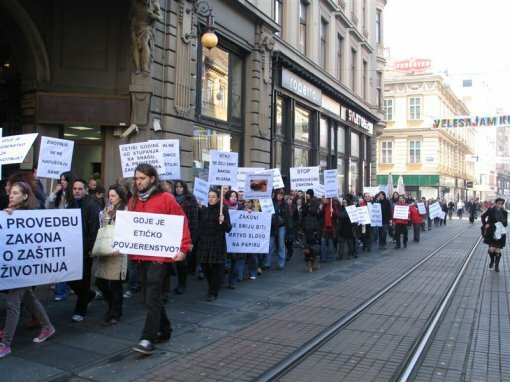 Therefore, Animal Friends and the Network Against Animal Abandoning, which consists of the representatives of more than 50 organizations concerned with animal protection, invite everyone to join the protest on Saturday, January 15, 2011. 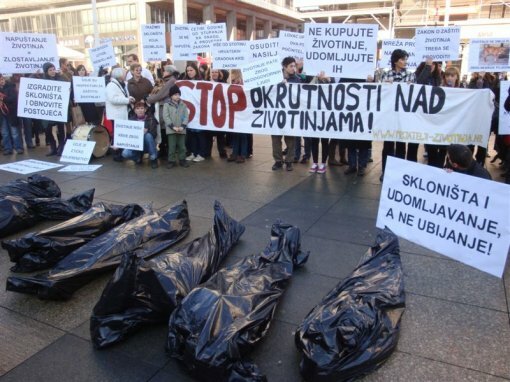 The protest procession will the start at 11 A.M. from Trg kralja Tomislava and take the following route: Trg Nikole Šubića Zrinskog (Zrinjevac), Teslina, Masarykova, Frankopanska, Ilica, Trg bana Jelacica – where the procession will end and an impressive performance will take place at 12 noon. The aim of the protest is to bring about change in the current practice of ignoring the legal obligations by the local communities. It is meant to encourage them to take responsibility in accordance with the legal and also ethical norms. Animal Friends is announcing that they will file charges against all veterinary stations that catch and kill animals, as well as those local communities that refuse to fulfil their legal obligations. Animal Friends and the Network will continue to initiate and offer cooperation in establishing shelters and implementation of the program of spaying/neutering, microchipping, and adopting animals, as well as educating people about these issues. 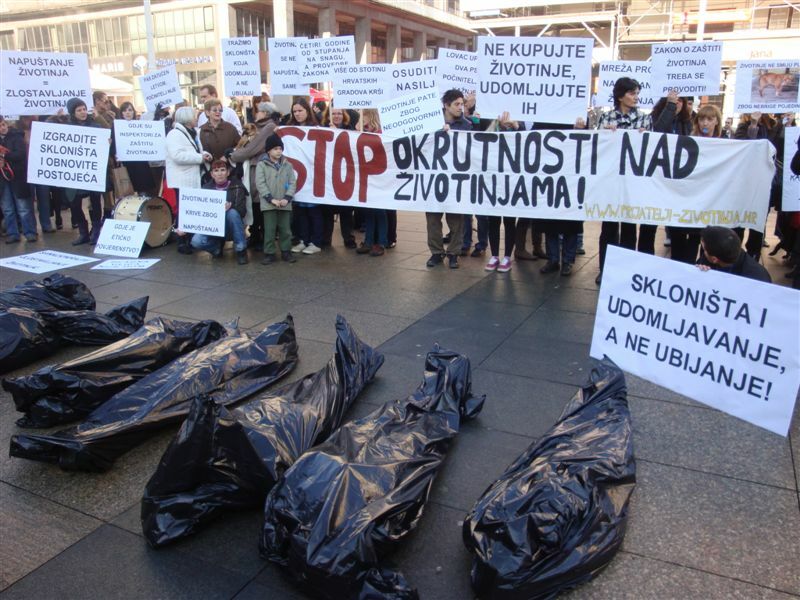 We will also continue to condemn all actions that result in inflicting harm upon animals, as well as endorse a complete ban of killing the abandoned animals, severe punishment for the perpetrators, consistent implementation of the mandatory microchipping of all dogs, as well as systematic education of people on animal protection.